I remember drinking my first cold brew at Starbucks. I had been an avid iced coffee drinker for years and was so intrigued to try this new creation. I took my first sip and was in heaven. I swear an angel came down into that Starbucks and gently kissed the top of my head. What's unique about cold brew is that because the coffee beans are never heated, the brew is super mellow and not bitter. 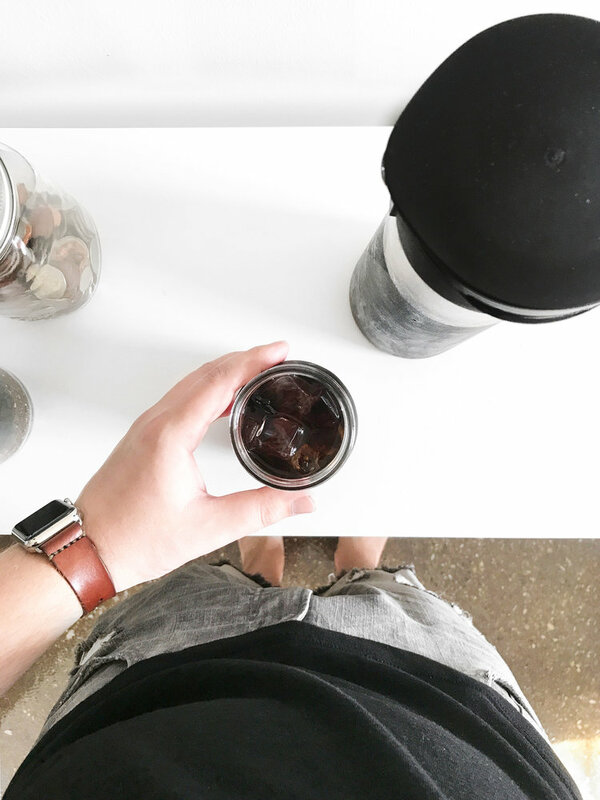 Curiosity did a great article that gets into the technicalities on why this is and the difference between cold brew and hot brew, check it out here. Back to my story: When Starbucks first started offering cold brew, it was available in very limited quantities. I knew it was only a matter of time before I encountered them running out in my time of need. I remember that fateful day like it was yesterday. Approximately two weeks after I made the switch to cold brew I glided into Starbucks and ordered a grande cold brew from my favorite barista, Heather. they. were. OUT. She asked if I wanted iced coffee instead and I reluctantly said yes. I mean, how bad could it be? I drank this nearly every day for years. I took a sip and waited for heaven's gates to open. ...my waiting was in vain. No angel came down to gently kiss the top of my head and my poor little taste buds wept. Am I being a tad bit dramatic? Maybe, but bottom line: after switching to cold brew, iced coffee just doesn't do it for me. Since moving to Chicago, I realized how much money I was spending on coffee and wanted to figure out how to make it myself. 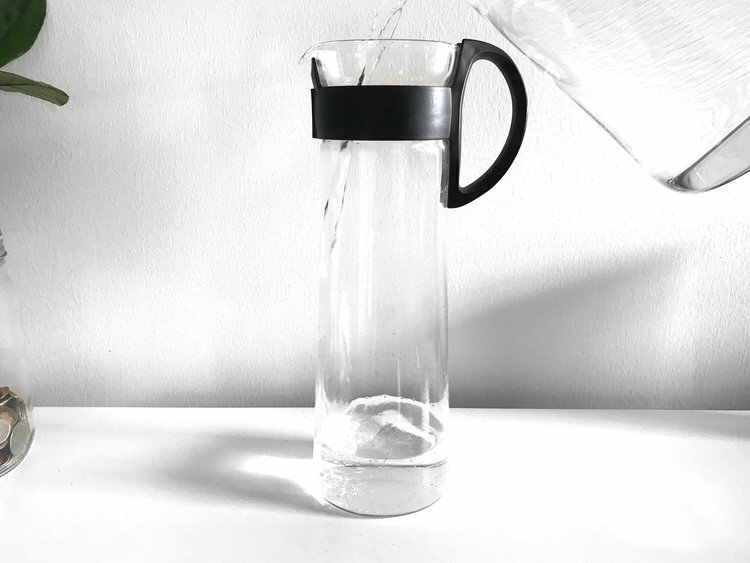 A colleague of mine recommended this awesome glass pitcher called Hario Mizudashi (there is a brown version on Amazon for around $15!) and now I can't recommend it enough. This brewer makes it so simple to brew your own. Follow me and I will lead you to happiness in a bottle. Wow. Have you ever seen such perfectly coarse, ground coffee? Pick up a bag of dark roast coffee beans from a local coffee shop or Starbucks and ask them to grind the beans for you with a coarse grind for cold brew. 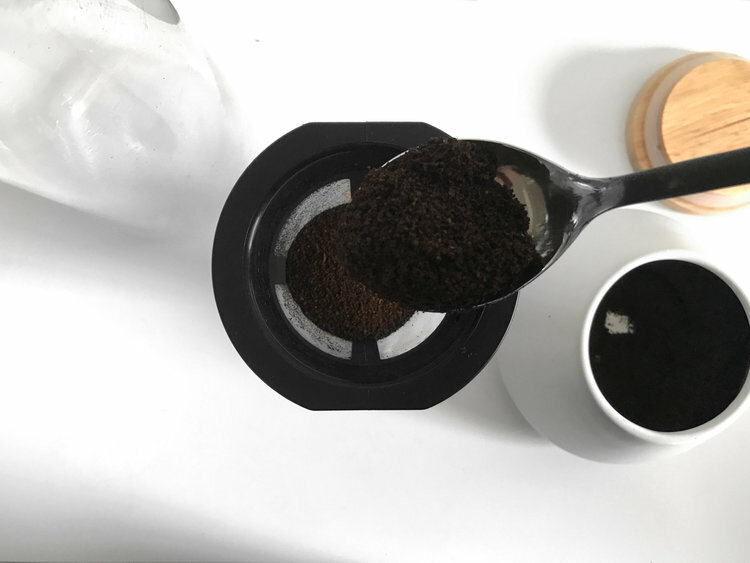 Once you have the grounds, take the inner mesh filter of the Hario Mizudashi and fill it with coffee until it reaches where the mesh ends and the plastic ring begins, which is approximately one cup. "Just a spoonful of coffee helps the crushing-anxiety-that-goes-with-having-student-loans go down! In the most de-light-ful way!" Fill the glass pitcher a little over halfway with filtered water and place the mesh filter (now filled with ground coffee) inside. Slowly add water through the mesh filter and gently stir the coffee grounds with the end of a spoon to agitate the grounds. Go slowly or else you're going to have a mess on your hands and be very careful with the delicate mesh filter. Once the grounds have been agitated and the pitcher has been filled to the top, place the cold brew maker in the refrigerator for 24-48 hours. Not 12 hours. Not 18 hours. 24 minimum. You'll thank me. After a day or two, take the mesh filter out and empty the grounds. I like to use the coffee grounds as fertilizer for my plants, but you can totally throw these away. I won't judge. Grab a glass filled with ice and pour that sweet, sweet nectar of the gods on top. Some people like to dilute the cold brew concentrate with water. ...I am not one of those people, but you do you. The most important thing is to sit back, take a sip, and enjoy!